This is a mechanical procedure that is necessary to divide the hides into two parts along the section. The grain (hair/upper side) is separated from the split (meat/lower side). 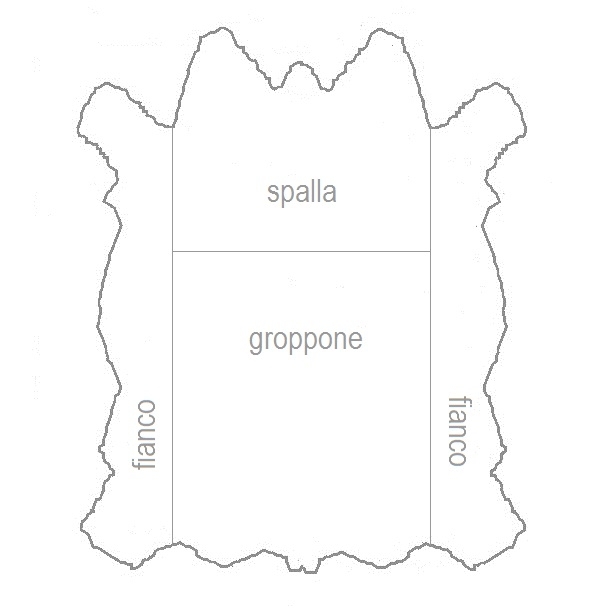 In this case, it is said that leather is split ‘in trippa’. Through this operation, excess water is eliminated and the hide is stretched. FA.PEL Srl’s job starts at this point of the leather production chain. Our company is specialized in the production of cow split leathers. Depending on the article and on the customer’s needs, we use butts, shoulders and bellies. Therefore, the selection of raw material (in trippa split or Wet blue split) represents one of the most delicate phases in order to obtain a quality product consistent with the customer’s requests. For this reason, the provision is a phase looked after in an obsessive way by FA.PEL Srl. Moreover, thanks to 25-years of experience in the field, this results to be one of the main strengths of our company. This procedure takes place inside drums where leather splits come into contact with water, colorants, fat substances, anti-mould and re-tanning chemical agents able to give the leather its desired colour and softness. The split’s surface is slightly scraped using sandpapers which make leather more ‘closed’ and aesthetically superior, and they also give leather a velvety aspect. Depending on the article to be done, layers of colour or covering effects are given to the leather. This application is done using spray guns. The process of ironing is necessary in order to stretch and extend the resins contained in the leather, so that these give a better result to the finished split.